The 2018 Jeep Cherokee builds upon decades of off-road heritage with a modern design that also makes it comfortable and stylish on the road. The design of the body gives the new Jeep Cherokee plenty of ground clearance for enhanced off-road capabilities and it has slick touches like standard 18-inch chrome wheels and standard painted exterior trim instead of the bare plastic many of its competitors use. Meanwhile, competitors such as the Ford Escape, Honda CR-V and Mazda CX-5 don't offer the same ruggedness. The interior of the 2018 Jeep Cherokee is designed to be spacious and practical with a great deal of storage space. It continues the new Jeep Cherokee's comprehensive approach to design by also incorporating available luxurious leather trim throughout. Experience the 2018 Jeep Cherokee's commitment to balanced design for yourself. Test-drive yours today at Bob Moore Chrysler Dodge Jeep RAM of OKC. The new Jeep Cherokee is constructed to handle anything life might throw your way, even an accident. It features a lineup of 10 carefully-placed airbags, including airbags rarely seen in its class, such as passenger knee airbags. Jeep knows a modern approach to safety also includes a full suite of driver aids, so the 2018 Jeep Cherokee offers available Blind Spot Monitoring and available LaneSense® Land Departure Warning technology. See how the safety technologies in the new Jeep Cherokee elevates your driving experience. Take an exciting a test drive today at Bob Moore Chrysler Dodge Jeep RAM of OKC. The 2018 Jeep Cherokee shines brightest when driving off-road, as you'd expect from a Jeep. It continues Jeep's commitment to making SUVs with go-anywhere capability by offering excellent performance on a wide variety of roads. The standard powertrain is a 2.4L 4-cylinder engine with a 9-speed automatic transmission that offers smoothness and versatility. There are 3 different versions of Jeep's legendary 4-wheel drive system available. 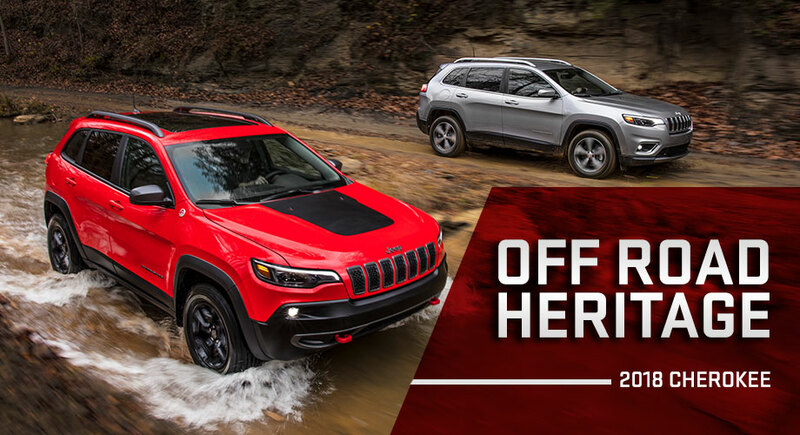 Take the new Jeep Cherokee for a test drive today at Bob Moore Chrysler Dodge Jeep RAM of OKC and experience the legendary versatility and the breathtaking performance. The 2018 Jeep Cherokee. has an impressive array of cutting-edge tech on offer, thereby rejecting the idea that tough, durable SUVs have to be bare bones and basic. The standard tech includes Jeep's signature Uconnect® 3 infotainment system, which allows the driver to control multiple functions using a 5-inch color touchscreen. Optional technology includes a premium 12-speaker Alpine© audio system and digital Driver Information Digital Cluster Display gauges. If you're in Oklahoma City, check out the 2018 Jeep Cherokee's tech for yourself by taking a test drive at Bob Moore Chrysler Dodge Jeep RAM of OKC today.